4 Ring hor cable manager: 19 inch mount, 1U (Quantity :1). A simple open frame solution to house IT equipment and provide maximum cabling access and capacity. 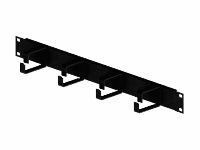 Ideally suited for network closet applications and telecommunications rooms for copper and fibre patching, or as a passive rack in large data centres where they can be used for distributing LAN connections. The open access design allows for ease of installation and provides a secure connectivity solution for all internationally recognized cabling standards, including CAT 8. A comprehensive range of cable management accessories is also available to maximise cabling access and capacity and to provide users with the tools to configure the system to match individual applications.